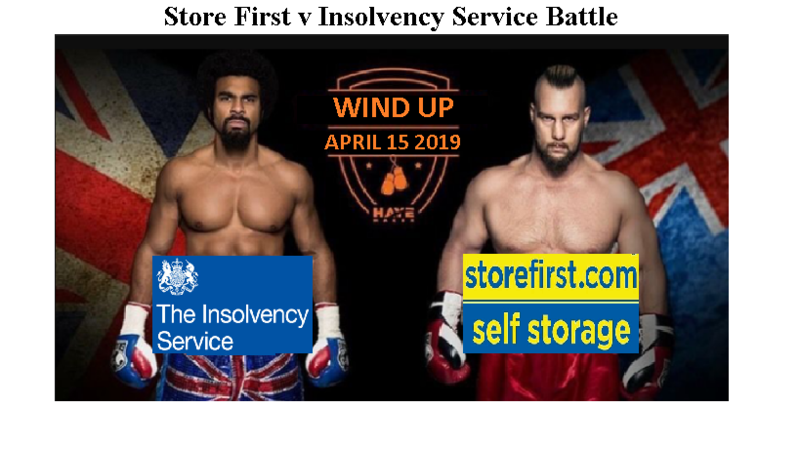 April 2019 sees the battle between Store First and the Insolvency Service. On April 15th, the High Court proceedings will kick off. As a result, the Store First v Insolvency Service will determine how many people will lose their pensions permanently. Two sets of very expensive lawyers – DWF and Eversheds Sutherland – will battle it out to see if Store First can continue trading. In the end, if the Insolvency Service wins the war, then both law firms and an insolvency practitioner will get rich. You can read the Insolvency Service’s witness statement here. As a result of the Insolvency Service winning, 1,200 pension scam victims will probably lose the majority of their investments in Store First. In most insolvencies, there is little left after the various snouts in the insolvency trough have had their fill. Investors will be lucky to get 10p in the pound. If there’s an “R” in the month. And if it is snowing. And if Brexit has a “happy ever after” ending. The Insolvency Service says it is “in the public interest” to wind up Store First. But are they right? Isn’t winding up the company going to do even more unnecessary damage? One very important issue is that the Insolvency Service’s witness statement dated 27.5.2015 (by Leonard Fenton) is so full of inaccuracies, misunderstandings, incomplete facts and an obvious failure to understand how the scam worked – as to be utterly laughable. The Insolvency Service and the High Court will rely heavily on this witness statement – and yet it has so many holes and errors that it is misleading, incomplete and meaningless. I asked the Insolvency Service questions about the incorrect and incomplete statements and made numerous comments on the failings contained within the statement. But the Insolvency Service did not even have the courtesy to reply or even acknowledge my contribution. In my view, this is arrogance and incompetence in the extreme. Why did HMRC and tPR register Capita Oak and Henley Retirement Benefits Scheme as pension schemes in the first place? How many of the many scammers behind Capita Oak and Henley have been prosecuted? Is there an explanation as to why Berkeley Burke and Carey Pensions are still trading? The reason for my questions is that both HMRC and tPR were negligent in registering the two occupational pension schemes. This was because the schemes were obvious scams from the outset. They both had non-existent sponsoring employers which had never traded or employed anybody. And they weren’t even in the UK. HMRC was blind, stupid and lazy at the start – when these two schemes were registered by known scammers. But several years later, HMRC woke up pretty smartly and sent out tax demands for the “loans” the victims received. The Store First v Insolvency Service Battle is probably doomed to ignore HMRC’s negligence in causing this disaster in the first place. James Hay and Suffolk Life had been facilitating the Elysian Fuels investment scam at around the same time. And this was with the considerable “help” of serial scammer Stephen Ward. So, this was a prime time for scams and scammers. However, both HMRC and tPR failed the public back then and have continued to do so ever since. In 2015, the Insolvency Service identified and interviewed most of the scammers behind the Store First pension scam. In their witness statement dated 27th May 2015, Insolvency Service Investigator Leonard Fenton cited statements and evidence from all the key players. That is fifteen scammers who have never been prosecuted. They have not only never been brought to justice, but many of them went on to operate further scams and ruin thousands more lives – destroying more £ millions of hard-earned pension funds. And what of Toby Whittaker’s Store First? There is no question that store pods are not suitable investments for pension fund investments. Car parking spaces are unsuitable for pensions as well. There are, in fact, a long list of inappropriate investments for pensions – including anything high-risk, illiquid and expensive or commission-laden. Risky, unregulated funds and bonds such as Blackmore Bond, Blackmore Global, London Capital & Finance, Trafalgar Multi Asset Fund, LM, Axiom, Premier etc. All the above are routinely used and abused by pension scammers as “investments” for some dodgy scheme. Invariably, the above investments come with pension liberation fraud and/or huge introduction commissions and hidden charges. However, it is rarely the fault of the artist, wine maker, start-up entrepreneur, truffle farmer or property developer that the scammers profit so handsomely from abusing their products. I hope Store First defeats the Insolvency Service in the forthcoming battle in the High Court this month. And I hope that the public and British government will finally get to see what embarrassingly inept, corrupt, lazy regulators and government agencies we have. I will publish the Insolvency Service’s witness statement separately for anyone who wants to read the Full Monty. Let us not forget that the solicitors acting for the Insolvency Service – DWF LLP – also act for serial scammer Stephen Ward. It was Ward who was responsible for the pension transfers which subsequently invested in Store First. Had it not been for him, 1,200 victims’ pensions totaling £120 million wouldn’t now be at risk. But, somehow, DWF LLP doesn’t think that is a conflict of interest?!? Let us be clear: if the Insolvency Service wins the court case, the investors will get nothing. This will mean that, yet again, the victims will get punished. If Store First wins, the investors will get at the very least half their money back. If they are patient, they may even get it all back. What is the basis for this absolutely extraordinary claim? The investors’ money is long gone. We both know how a scheme like this works. You know better than most where the investors’ money went and we both know it ain’t coming back. Why are you attempting to give false hope to the victims? A firm offer was already made to buy the pods back for at least 50% – but Dalriada Trustees turned it down. Great news. When the Official Receiver takes over Store First they can simply give this mysterious mug a call. Job done. How is that a reason to leave the scheme in the hands of Toby Whittaker? Why did Dalriada turn it down? Was this firm offer contingent on Dalriada paying all the “legal fees”, perchance? Nunn & McCreesh, mentioned in the above report – No.13 in the key players- received almost £1m for providing 200 leads a month later went on to form two more companies, Aspinal Chase and Pension & Life UK Ltd plus their own fund – Blackmore Global. Together with a with a firm owned by John Fergusson and David Vilka, Directors of Square Mile International Financial, they set set about recruiting subscribers to their own opaque unregulated fund. Subscriptions came from UK defined benefit transfers via offshore QROPS in the Isle of Man, Malta and Hong Kong who willingly facilitated the operation. The BBC reported the business relationship between Nunn & McCreesh and Square Mile – https://www.bbc.co.uk/news/business-42776709 – and a pathetic cash offer made to me to try to silence me. Nunn & McCreesh’s legacy is a road littered with victims of pensions scams left facing financial ruin in their retirement. They have engaged in nefarious activity stretching back to 2012 – 7 years! Here we are in 2019 and no one has been prosecuted and the actors in all these scams continue to trade with impunity. I submitted a complaint to Action Fraud only to be told they were not going to investigate it even though I have a shed load of hard evidence showing the [mis-]advisor – Vilka – used fraudulent misrepresentations in the [mis-]advice he was providing!